Immunogen: Full-length recombinant GST-tagged human S5a (Accession number: P55036). Specificity: Recognizes the Rpn10/S5a subunit of the 19S regulator complex. Purity Detail: Purified by immunodepletion of GST-reactive antibodies followed by Protein A purification. Scientific Background: S5a/Rpn10 is a major ubiquitin binding protein that binds preferentially to polyubiquitin chains. It is found as a non-ATPase subunit of the 19S regulatory complex of the 26S proteasome where it functions as a receptor for proteins destined for proteolytic degradation.In yeast, the homologue of S5a, Rpn10, is required for degradation of a subset of cellular proteins by the proteasome. Unlike other proteasome subunits, S5a exists predominantly as a free protein in the cytosol (i.e. not incorporated into the proteasome), though its precise role in the cytosol has yet to be fully elucidated. S5a contains two approximately 15 amino acid ubiquitin interacting motifs (UIM) which are responsible for its binding to polyubiquitin chains. 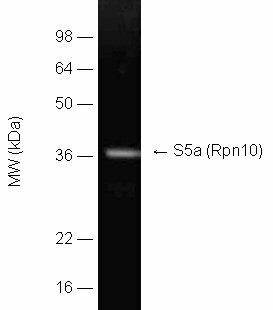 Detection of S5a (Rpn10) 19S proteasome regulator subunit in purified 26S proteasome sample (50ng, BML-PW9310) by Western blotting using BML-PW1045 at 1:1000 dilution.